Nearly all the journalistic criticism of the speakers involve the low end of the speaker, much of it incorrect. 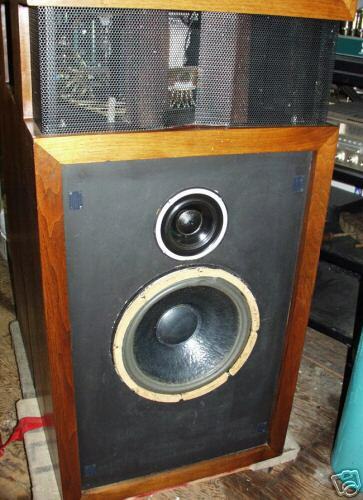 Below a switch selectable 700 Hz or 1 kHz crossover point, the Plasmatronics 1A used a conventional 14.1″ French built Son-Audax woofer and a 6.5″ midbass driver in two separate sealed enclosures. The midbass enclosure included a medium size rock to break up potential standing waves within the small space. Rumor has it that these rocks were hand selected by Dr. Hill from the New Mexico desert. The user had the option of using the internal passive crossover between the bass and midbass driver or using an external crossover and triamplifying the system via a rear panel connector. The passive crossover was housed within the low frequency enclosure. Nominally this would require a 200 watt per channel stereo amplifier at a minimum to augment the system. Triamplification required an additional electronic stereo crossover and an additional stereo amplifier for the mid bass. More Plasma Bass, Less Cone? (Per member Tonehack) “Alan did build a lower range driver in the 80’s. It was downward firing because the helium had to be kept near all the little nozzles. His eldest son, Larry, helped build it (he was home from college for the summer). It was a round, approximately 5″ diameter array of hypodermic needles embedded in the same blue epoxy that holds the commercial driver. This array sat inside a kind of bell. Helium was fed through the needles and they were all electrically driven just like the commercial electrodes are. The sound output was measured with a microphone below the bell. I cannot remember the low-end cutoff, but it must have been around 200Hz. Other attempts to enhance the plasma tweeter have been made as well. 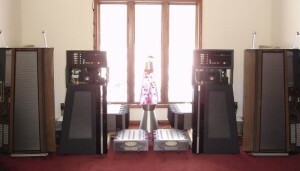 One member has mated his Plasmatronics equipment to an Apogee ribbon based low end, augmented with a pair of Eminent Technology TRW-17 subwoofer systems, which may be the ultimate in high fidelity technology when integrated. The combined bandwidth of the components alone alone should exceed that of every other speaker system ever built. P.S. Is that a lava light in the middle of the picture? FWIW, mine are not stock, having replaced the woofer and mid bass, as well as added a external Yamaha SP2060 electronic crossover to bypass the passive crossover and control delay. 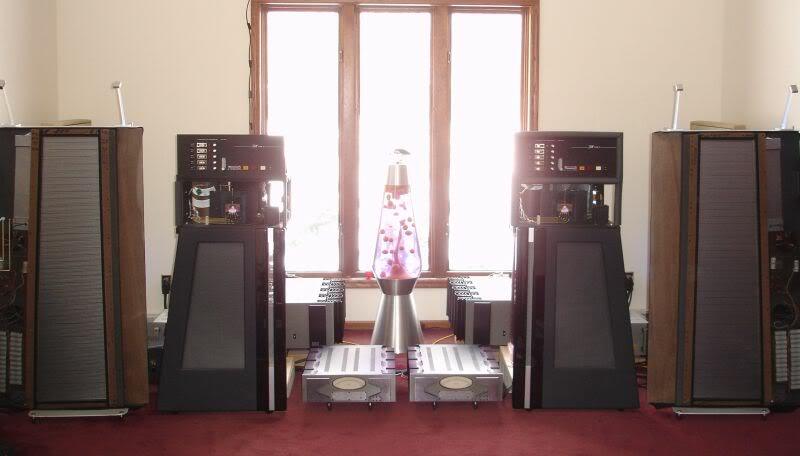 Having listened to thousands of audio systems in my career, they are the best and not by a close margin. Dr. Hill’s invention is one of the very few audio devices that kept a crossover out of the critical voice bandwidth.